Erica Meadows – Creative and generous! Thank you for your generosity, Erica! Erica Meadows had a great idea that she calls “Dolly & Me” matching necklace sets, one for a little girl and a matching one for her doll. With a little help from her aunt, Michele Meadows of Muskoka Yarn Connection, Erica made a batch, which quickly sold out. That would be impressive enough, but then Erica donated $80 of the proceeds to Manna. 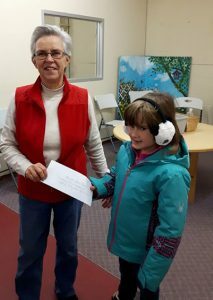 Here she is making her generous presentation to Manna volunteer Barb Rowlinson.